Last year I read Nicholas Eames’ first book, Kings of the Wyld, which ended up on my Books of 2017 list, despite the ‘Wyld’ made me think of the terrible fantasy epics of my youth and Wyld Stallyns from Bill & Ted. Luckily I had David (@bluebookballoon) to encourage me, and I found that Kings was (and indeed is) a splendid rollercoaster of the most rollicking kind, with a veritable smörgåsbord of beasts and monsters, evil villians, ex-girlfriends, former managers, relentless bounty hunters and what will soon become your favourite wizard since Gandalf (or Rincewind, depending on your literary tastes), Moog. Nicholas Eames showed us in Kings that he can tell a great story, with some properly brilliant characters. 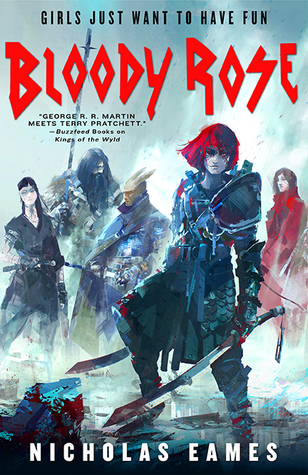 In Bloody Rose he builds on the world in the first book and delivers another cracking tale of high adventure, with yet more beasts, monsters and hijinks. The music references again come thick and fast, but never at the expense of story. They’re lovely little nods throughout the book – a town called Coverdale, a purple-veined prince, and at one point a namecheck for a character in Final Fantasy VII (the best one of the series, don’t @ me). The story is so much more than your standard ‘bunch of people go fight some monsters’ that you see so often in fantasy. It’s an exploration of family, both the biological kind and the kind you make yourself. It explores what it means to be a monster, and what they might think when all these shiny-armoured, sword-laden Bands come rampaging for their hides. It’s also very funny in places, and incredibly sad in others. The characters are, once again, utterly brilliant, from the young Tam growing from dreaming barmaid to daring Bard with Fable, to Rose herself – daughter of Golden Gabe from the original Kings, who wants to step out from the shadow of her father’s considerable, legendary shadow and prove herself in this world. The supporting cast are also great – Brune the vargyr, Cura the Inkwitch summoner (one of my favourites of the band), Freecloud the Druin (and Rose’s partner), and not forgetting their booker, Roderick. Kings of the Wyld was fantastic, and a very worthy winner of the Gemmell Morningstar Award, and that was against a frankly brilliant field of books. Bloody Rose is a worthy successor, and deserves to do just as well, if not better. Highly recommended. Bloody Rose by Nicholas Eames is published by Orbit and is out now. Thanks to Nazia for the advance copy. I agree, this was amazing. I love the way Eames is able to make the reader feel ALL the emotions, it’s rare to find that ability these days. Such a fantastic book, absolutely loved it.